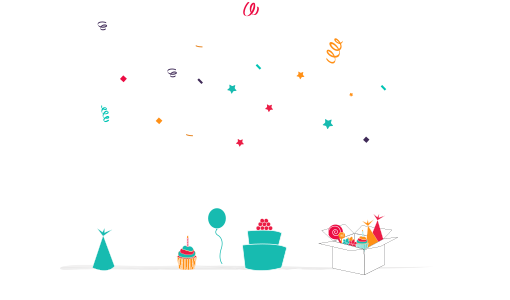 You may decide to throw a party for your child where there are no winners, just fun party games. Perhaps you would like a mixture of both co-operative and competitive party games. In either case this blog is for you. Build an obstacle course with chairs, boxes, sofa cushions, squishy shapes, pop up tunnels, sheets, hoops, bean bags and whatever else you can get your hands on. Some swing parks have ready built obstacle courses. You can time the kids to go round and then they can try to beat their own time. If you build a circuit in a circle, the kids go round and round for ages. Just be on hand to straighten things up or rearrange your design if it’s too crowded in one area. 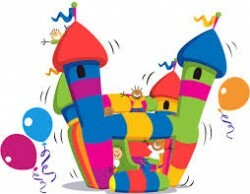 Hire a bouncy castle so that kid’s can bounce to their heart’s content. Be on hand for any bumps that may be had and provide plenty of squash to quench the party goers thirst. Plastic sheeting, a little washing up liquid and plenty of water make a fun water slide that the kids will love. A slight hill will make the slide even faster. 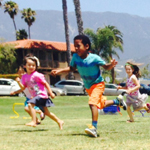 Loads of fun for a sunny outdoor party. The children pretend to drive around the party venue. Either shout out red, amber and green or cut out large coloured circles and hold them up. Both is good! When you shout ‘Red’ the players must stop, when you shout ‘Yellow’ the players slow down and of course ‘Green’ means go! Keep playing until everyone is pooped. Put prizes around the garden and let the party goers search. For older kids you may want to leave clues, big arrows made of sticks and such like are good for younger children. You may want to limit the amount of prizes each child can find or get the kid’s to bring back all of the prizes so they can be shared out at the end of the game. Grab your magic wand and turn everyone into frogs. The players must all pretend to be frogs and jump around the party venue. Turn them into whatever creatures you like – from birds to dinosaurs. You can also get the kids to take it in turns cast the spells. 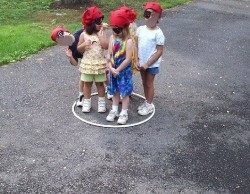 Magical circles are great for fairy parties or just to add a little magical fun to any celebration. 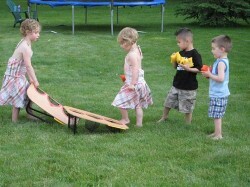 Read how to play it on my ‘Outdoor Party Games blog’. Get the kids to work on a big mural together, or draw around themselves and cut themselves out. Wall paper lining is excellent for this. Just add scissors, crayons or fibre tip pens. Cut out large circles or use hula hoops. Children dance around the circles and when the music stops they jump onto one. Every time the music stops take one circle away but instead of children being ‘out’ they should share a circle or hoop with another child. Keep going until the children can’t squeeze on anymore and they all fall off or fall over! Make a target from a box and get the children to line up and throw the bean bag through the hole. Children can carry on for as long as they like. It’s a good game to set up and leave as some kids may want to play it again and again. Whether you paint the faces yourself, hire a face painter or let the kids paint each other’s faces, face painting is fun and great for photo opportunities. Cardboard boxes, masking tape, flags, colouring pens, broom handles and whatever else you can find. Get the kids to build their own entertainment. 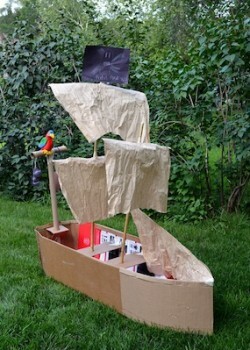 Forts, castles and pirate ships are always popular and the kids can play with their creation afterwards. Get out your dressing up box or get the kids to come in fancy dress. Set up a little scene and take photo’s of all the party goers. You can print them out for fantastic thankyou cards afterwards. Thrones are great for princess parties and a Jolly Rodger flag makes a great back drop at a pirate party. Whatever games you choose for your party we hope you have loads of fun. 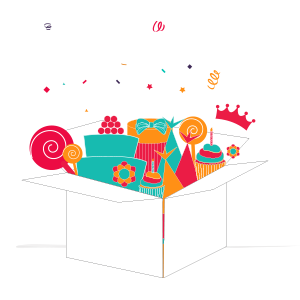 Feel free to check out our complete party packages which include great value themed kids parties.